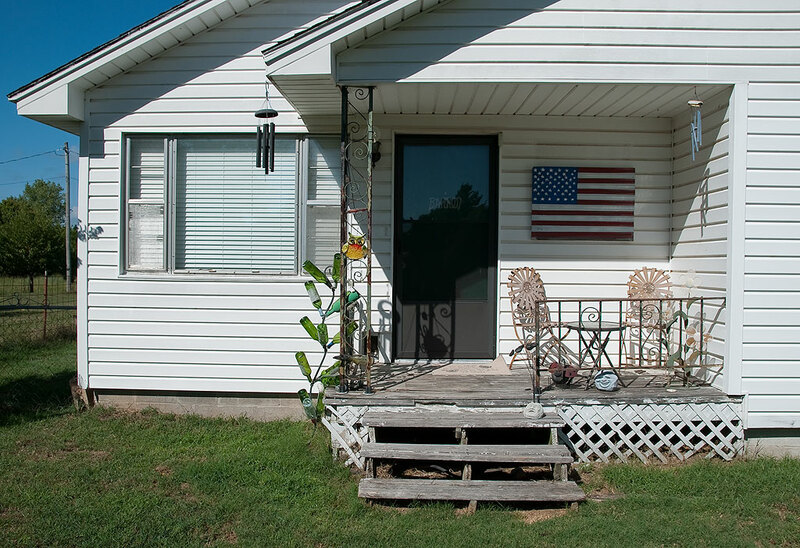 Over the past ten days, Abby and I, along with hired part-time carpenter Jerry Dale Loveless (Abby’s best friend’s son) have been working to replace our worn-out front porch with a deck. Jerry did all the woodwork, while Abby picked the colors and designed the layout, and I did all the painting. 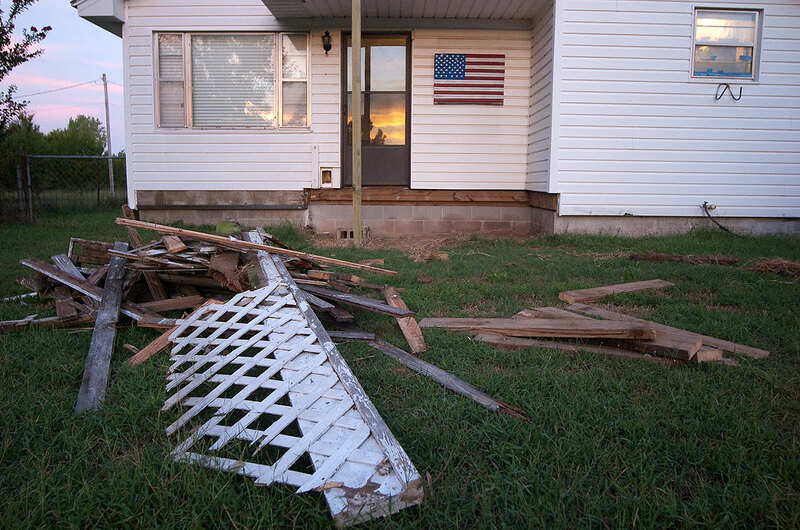 This is our old front porch. You can see that its paint was mostly weathered off, and there were several places where it was starting to crumble. With the front porch gone, the house looks oddly naked. Additionally, there was no access to the front yard for the dogs, so we had to leash them and walk them for a couple of days. Between paint, screws, lumber and other odds and ends, this project wasn’t cheap, but we wanted to do it right. 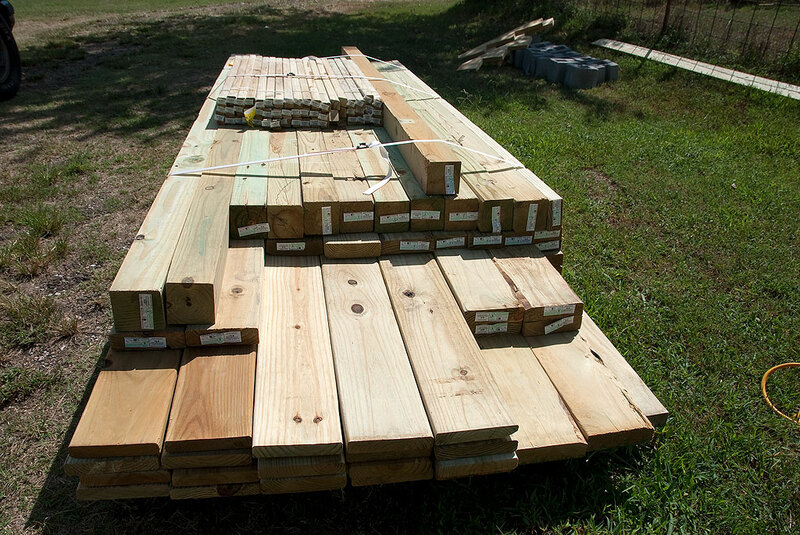 We got our lumber at Mead, which was about 30% cheaper than The Home Depot. 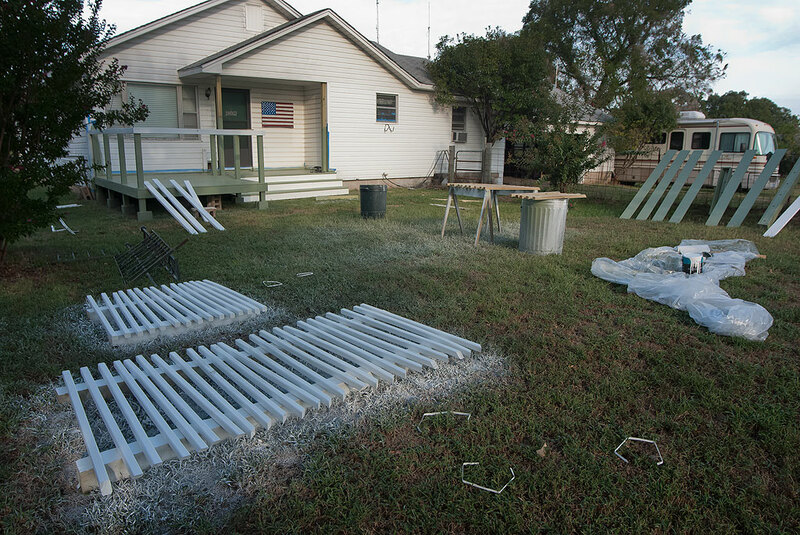 This is the porch and deck at a midpoint in its assembly, prior to being painted. Abby bought this paint sprayer a couple of years ago, but we just now got around to using it for the first time, but had to replace the batteries. 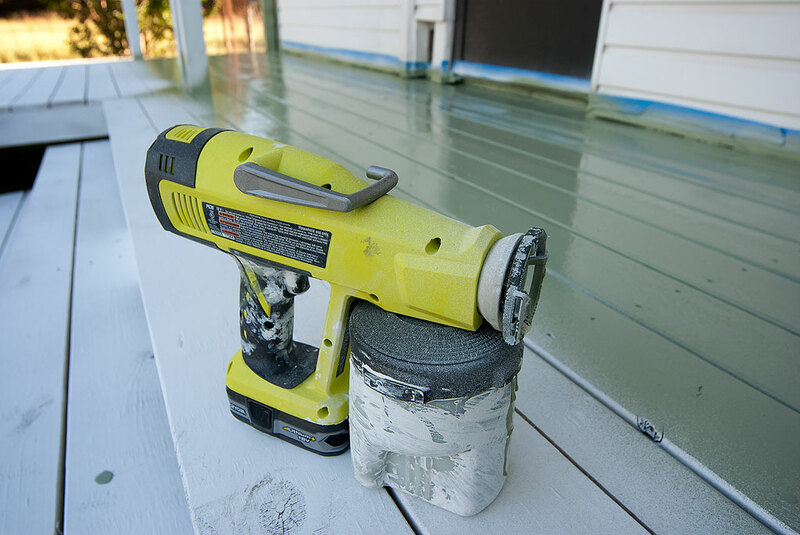 A power tool like this makes the work go a lot faster, but can be pretty messy. Farther along in the process, I laid out balusters and handrails to paint. 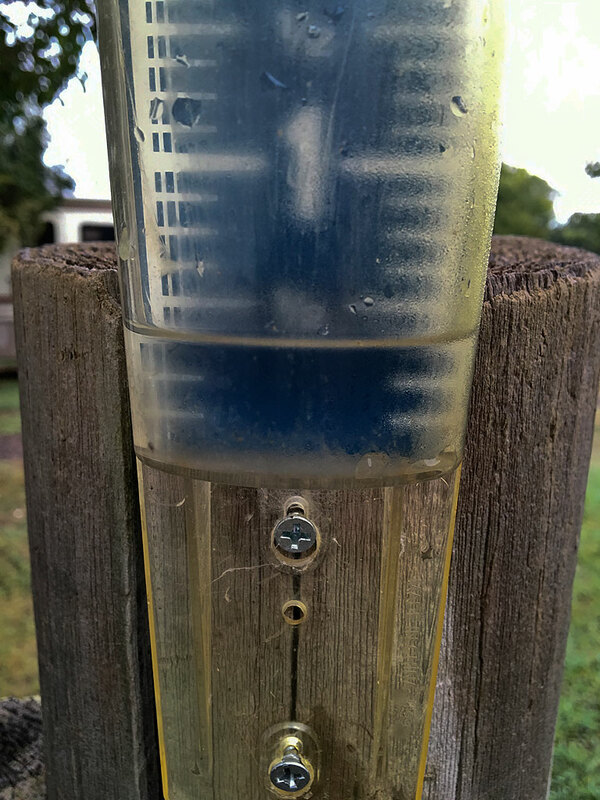 We got about a half inch of rain last night. Abby and I hoped to finish the project last night. 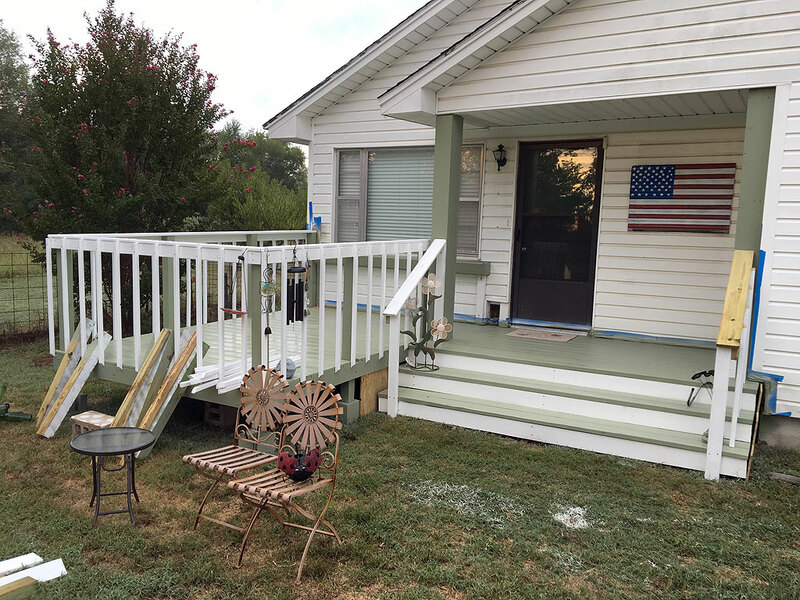 Jerry’s woodwork was done, and I hoped to touch up the paint and get the patio furniture in place, but in the evening yesterday, we got a welcome bit of rain, so I concentrated on priming the slats for the bench. In the end, it was a satisfying domestic project that we think will be nice to use, and will make the house look great. 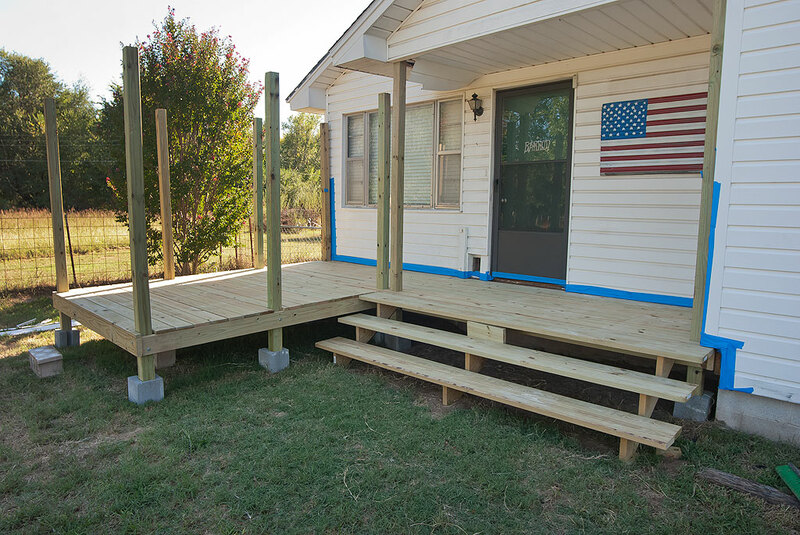 This is the porch and deck as they appeared first thing this morning. Aside from a couple of items to touch-up with some paint, it’s finished and ready to enjoy. What a wonderful project. I’m sure you’ll enjoy this for years to come. I can’t wait to sit out there this winter and drink hot coffee! I’m having serious front outdoor space envy. I never would have thought to utilize that space in front of the living room window. Good thinking Abby! Love the paint colors too.